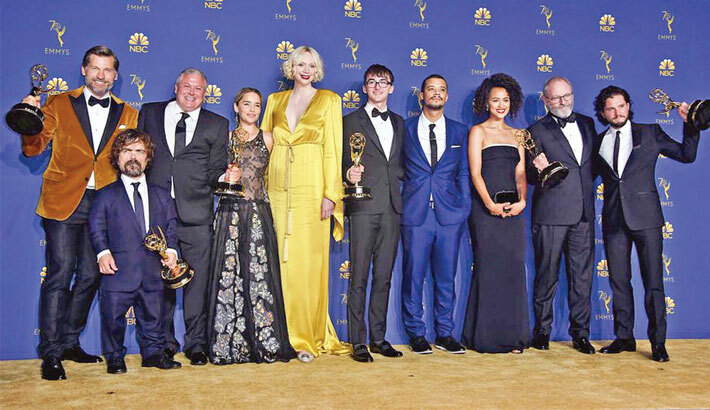 HBO’s record-breaking fantasy epic “Game of Thrones” stormed back onto the Emmys stage on Monday, winning the coveted best drama series prize on a night full of surprises, including an on-air marriage proposal that stunned the audience, reports AFP. The other big story of the Hollywood gala, television’s answer to the Oscars, was the huge success of “The Marvelous Mrs Maisel,” Amazon’s story of a 1950s housewife-turned-stand up comic, which took home eight Emmys overall, including the best comedy award. “The Handmaid’s Tale”—last year’s best drama and an early favorite for more hardware in 2018 -- went home empty-handed from the star-studded event at the Microsoft Theater, after winning three minor awards handed out a week ago. The ceremony hosted by “Saturday Night Live” regulars Colin Jost and Michael Che took on a decidedly political hue at the start, with a barrage of edgy jokes on hot-button issues from diversity in Hollywood to #MeToo and Donald Trump. The gala also saw several sentimental favorites take home their first Emmys. But the coveted drama prize went to “Game of Thrones,” which was ineligible for last year’s Emmys, and series star Peter Dinklage took home the best supporting actor prize for his portrayal of Tyrion Lannister. “Writing for these actors behind us is the honor of a lifetime,” said the show’s co-creator David Benioff. “GoT” won nine Emmys this year, meaning the blood-spattered cinematic tale of noble families vying for the Iron Throne—which returns in 2019 for an abbreviated eighth and final season—now has 47 awards overall. That breaks the program’s own record as the most decorated fictional show since the Television Academy first handed out prizes in 1949. In the comedy categories, “Mrs Maisel” bested all comers in its first year of eligibility, sweeping the female acting prizes (star Rachel Brosnahan and co-star Alex Borstein) and best series honors. Earlier this year, “Maisel” won two Golden Globes. “One of the things I love the most about this show... it’s about a woman who is finding her voice anew,” Brosnahan said. HBO dark comedy “Barry” notched two acting wins—for Winkler and series star Bill Hader. The Emmys opened with a daring song-and-dance number poking fun at myriad controversies including the problem of ensuring diversity in Hollywood productions. “We solved it!” crooned “SNL” nominees Kate McKinnon and Kenan Thompson, with back-up from pop stars John Legend and Ricky Martin—and even RuPaul. They then yielded the stage to Jost and Che—who let the zingers fly. “This year, the audience is allowed to drink in their seats. Hope you’re excited about that—because the one thing Hollywood needs right now is a bunch of people losing their inhibitions at a work function,” Jost said, in a reference to #MeToo. Looking to boost audience ratings, Emmys organizers said they were hoping to shake up the broadcast—and indeed they did, intentionally and unintentionally. A surprise marriage proposal from Emmy-winning director Glenn Weiss won over the audience—and the internet. As Weiss accepted his award for directing the Oscars, he asked Jan Svendsen, who was sitting in the audience, to marry him. “You wonder why I don’t like to call you my girlfriend? Because I want to call you my wife,” he added to cheers, applause and a few teary-eyed actors in the audience. Svendsen then joined Weiss on stage as the director got on one knee and formally proposed. The moment was especially poignant as Weiss revealed his mother had recently passed away—and offered Svendsen the ring his father had given his mom. Other big winners included FX’s “The Assassination of Gianni Versace,” which won Emmys for best limited series and an acting prize for Darren Criss, who earned rave reviews for his dark turn as the designer’s killer Andrew Cunanan. “I don’t even believe in God but I’m going to thank her tonight,” Newton quipped. “Saturday Night Live” won the award for best variety sketch series. In the emerging battle of traditional networks vs new platforms, streaming giant Netflix and HBO ended in a dead heat at the top—at 23 Emmys each. Stay tuned for the next episode in that duel... at next year’s Emmys. OUTSTANDING COMEDY SERIES: "The Marvelous Mrs Maisel"
BEST LEAD ACTOR, DRAMA: Matthew Rhys, "The Americans"
BEST LEAD ACTRESS, DRAMA: Claire Foy, "The Crown"
BEST LEAD ACTOR, COMEDY: Bill Hader, "Barry"
BEST LEAD ACTRESS, COMEDY: Rachel Brosnahan, "The Marvelous Mrs Maisel"
BEST SUPPORTING ACTOR, DRAMA: Peter Dinklage, "Game of Thrones"
BEST SUPPORTING ACTRESS, DRAMA: Thandie Newton, "Westworld"
BEST SUPPORTING ACTOR, COMEDY: Henry Winkler, "Barry"
BEST SUPPORTING ACTRESS, COMEDY: Alex Borstein, "The Marvelous Mrs Maisel"
BEST LEAD ACTOR, LIMITED SERIES OR MOVIE: Darren Criss, "The Assassination of Gianni Versace: American Crime Story"
BEST LEAD ACTRESS, LIMITED SERIES OR MOVIE: Regina King, "Seven Seconds"
BEST VARIETY SKETCH SHOW: "Saturday Night Live"